Dry rock gardens, succulent plantings. A great plant for a larger treelike bonsai. Fun specimen to plant around pools and stark architecture or in front of a contrasting-colored wall where its interesting shape can be set off. Replant cuttings, collect seeds after flowering. Sow uncovered in coarse sand topping with well-drained soil underneath. Seeds germinate readily during cooler weather. Root rot, requires good draining soils. Tylecodon paniculata var. 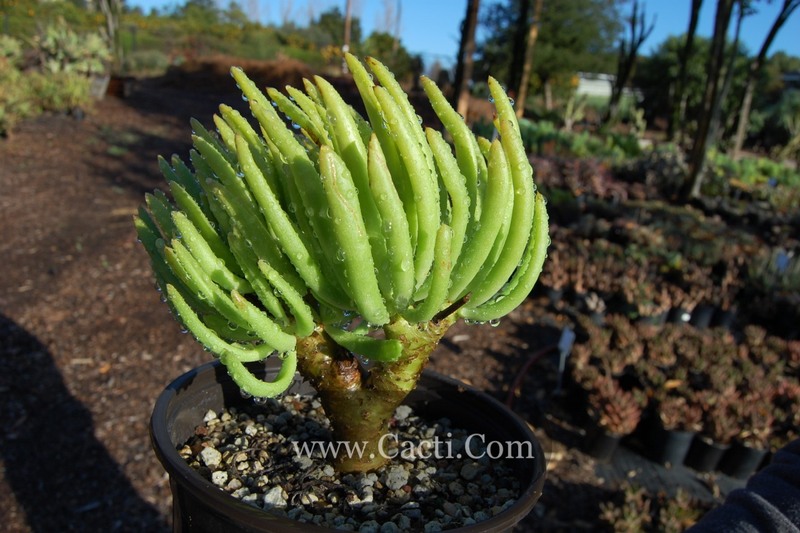 dinterii is a succulent shrub-let that is up to 4' tall. It is summer deciduous in hot dry climates. The stem fattens and leaves come out in winter rains. It has a thick basal stem that is densely branched above, with a rounded crown. The branches are softly succulent (hence its common name) and green with a yellow, semi-transparent peeling bark. Tylecodon paniculata var. dinterii is believed to be a natural hybrid between T. paniculata and T. wallichii. It differs from T. paniculata by having narrower, cylindrical gray green leaves and yellow-green flowers of T. wallichii. During the hot dry summer months Tylecodons conserve energy and water by dropping their leaves and photosynthesizing with their greenish stems. This caudiciform-like tree blossoms during summer when it is mostly leafless putting the flowers and later the yellow-green stems on full display. Its flowers are pollinated by nectar-loving birds. It is poisonous to livestock.